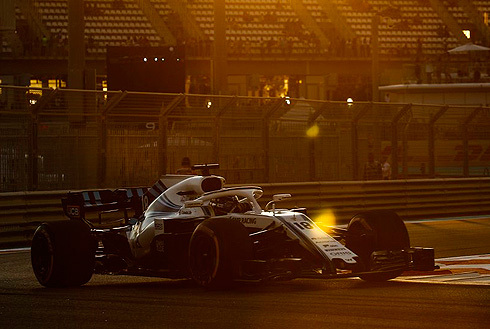 In what was a continuation of their difficult season the Williams Martini team would see their drivers slowest in the seconbd Friday practice session for the 2018 Abu Dhabi GP. The results would see Lance Stroll finishing in 19th and team-mate Sergey Sirotkin slowest in 20th. Both drivers would set their quickest times using the hypersoft tyre followed then by split tyre evaluations using the soft and ultrasoft tyre. Based on these results it would appear that the rest of the weekend is going to be a very difficult on for the Williams team. Both Williams drivers would take to the track early for the second Friday practice session. The track would become busy as more drivers took to the track as Raikkonen went fastest with a 1m:40.224 followed by Vettel and Grosjean all on the soft tyre. Magnussen was now third but the order would quickly change as Bottas went fastest with a 1m:38.600 using the ultrasoft tyre. Hamilton was second using the soft tyre while the Williams drivers were now ninth and 15th. Raikkonen was third followed by Vettel, Ocon, Hulkenberg, Magnussen, Sainz, Lance and Ericsson tenth. Verstappen would split the Mercedes going second with team-mate Ricciardo now in fourth. Raikkonen was fifth followed by Vettel, Gasly, Leclerc, Sainz and Hulkenberg in tenth. Verstappen would have to pit after having beached his car on the kerb at Turn 20 running along it possibly damaging his floor. The Williams drivers were 14th and 20th been the only ones to use the hypersoft tyre. On the ultrasoft tyre Ricciardo would go quickest with a 1m:38.582. With just over an hour remaining the track was empty with only the Ferrari's running. On the hypersoft tyre Raikkonen would go quickest with a 1m:37.461. team-mate Vettel would set a 1m:37.569 to now be second. Grosjean would move up to third also using the hypersoft. Hulkenberg and Sainz were now fourth and fifth also using the hypersoft. But Hamilton and Bottas would complete their hypersoft tyre runs to see Bottas quickest with a 1m:37.236 followed by Hamilton and Raikkonen. Verstappen would move into second ahead of Hamilton. Ricciardo was now in sixth with the top ten all having set their times on the hypersoft tyre. On another lap Ricciardo would move up to third. With all the quick laps completed drivers were now on longer runs on different tyre types. 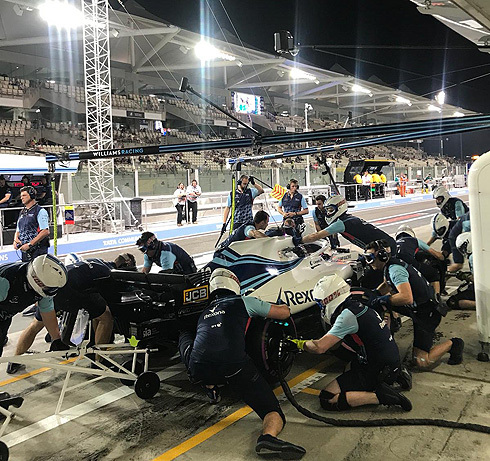 The Williams drivers were still 18th and 20th and would now on split tyre evaluations with one driver on the ultrasoft and the other the soft with just over twenty minutes remaining. Bottas was still quickest followed by Verstappen, Ricciardo, Hamilton, Raikkonen, Vettel, Grosjean, Hulkenberg, Magnussen, and Ocon tenth. Drivers were now doing runs on the soft and ultrasoft tyre with six minutes remaining. 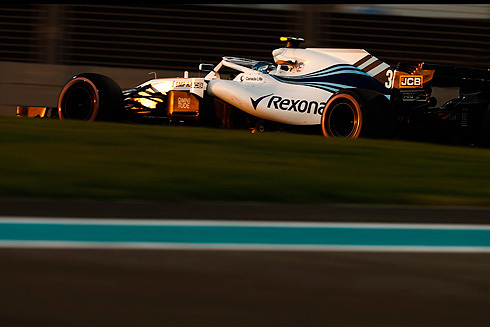 As the session drew to a close the Williams drivers were now 19th and 20th and slowest. With the end of the session the order would remain the same while for Williams their finishing positions were not unsurprising. Another difficult Friday for the Williams team. Lance would head out first in the session running on new hypersoft tyres. Lance would set a 1m:41.081 on his first timed lap. He was quickest but would drop down the order to be fifth. He would improve with a 1m:40.561 to be fourth with ten minutes of the session completed. He would drop to sixth. Despite having improved with a 1m:40.248 Lance was now tenth. Lance would pit after a seven lap run currently 11th. This would become 14th with ten minutes of the session completed. With fifty minutes remaining Lance would return again on the hypersoft tyre currently 17th. Lance would set a 1m:40.145 but was now 18th. A 1m:40.046 and Lance would remain 18th. Lance would pit after a seven lap run. Lance would also return also on used supersoft tyres. But he would pit again switching to the ultrasoft tyre for his next run. As the session came to close Lance would drop to 19th and would finish with a long run on the ultrasoft tyre. Having missed the first session Sergey would be out early for the second running on hypersoft tyres. Sergey would set a 1m:43.271 to be second dropping to third. he would drop to ninth. He would improve with a 1m:41.832 but had now dropped to 12th. Sergey would find time but even with a 1m:41.156 was now 17th. This would become 20th and Sergey would pit after a nine lap run. After a short break Sergey would return again on new hypersoft tyres. He was on an improved lap going quicker in the first two sectors but a 1m:40.935 would see him remain 20th. He would continue to lap the circuit and would pit after a seven lap run. Sergey would return using the used supersoft tyres for his next run. But Sergey would pit switching to the soft tyre for his next run. Sergey would also complete his long run on the soft tyre as the session ended.